Twitter has started rolling out the new feature, email tweets from twitter.com.This new twitter feature allows you to send a tweet directly to someone with comments. 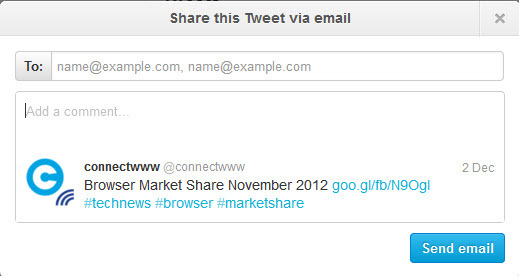 1.Hover the tweet and click the more link beside the Reply, Retweet, and Favorite links and select Email Tweet. 2.Add your to address and comment.Then click Send Mail button.